Join us for a viewing of Fantastic Beasts. The second movie in the series has Dark wizard Grindelward attempts to raise pure -blood wizards to rule over all non-magical beings. 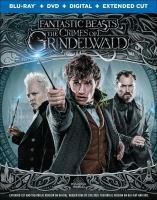 Albus Dumbledore and Newt Scamander, magizoologist attempt to thwart his evil plot.